I needed help with the communication in our home. I was told I appeared unhappy, miserable or angry. While I didn't see myself as such I agreed I could be happier. I felt betrayed by my family and decided to seek help. I was referred to Eileen Lichtenstein by someone that knew one of Eileen's specialties is Anger Management. I attended six sessions between November and December. Each session included a combination of conversation, workbook exercises, tapping and guided meditation. Most of our time focused on what I could change. I left the sessions feeling confident, encouraged, and uplifted. Hello Eileen, I know it's been a while since our session but, I just wanted to tell you Thank you again for helping me with your many gifts and talents. I came to you broken and overwhelmed. Feeling frustrated, I searched the internet seeking a place to sign up for anger management classes, which was a requirement that I needed. There was your website; www.balanceandpower.com. To my surprise you made yourself available to me. You are a very warm spirited person. The first session you explained everything in depth. We discussed in depth some things, and after handing me the book we started my session. What I have obtained from you I will cherish and pass on to my children and family. The classes/sessions helped me to not only acknowledge and take responsibility for my actions that caused me to have to see you. It allowed me to face it, change how I deal with situations, and the people that I interact with in a much better way. You gave me the tools, and you also showed me different techniques. The meditation CDs are very helpful with relaxing, and the tapping techniques, that I use when needed. I came to you overwhelmed, frustrated, and uncertain. You prepared me for my upcoming appointment with the Judge. I left the sessions feeling confident, encouraged, and uplifted. Thanks to you Eileen, I have a different outlook on life. I also have the tools that you have instilled in me. I will continue to use them. No one understands why I smile and stay calm when things around me are hectic. When things calm down I tell them about you and your program. I'm indebted to you. Stay Blessed. "A lady who knows her stuff and really cares about your balance in work and life. Eileen's skills have been developed over time and working with mostly executives, she know how to destress them and live in an equilibrium." You are an inspiring and encouraging individual coach and we all learned quite a bit from you at the meeting. "I am writing to you today to say a huge thank you for all that you gave to our members at our recent Meeting. The time, effort, and intensive style techniques demonstrating the effects of stress and how to change the moment for yourself were quite amazing. With a large group of people it is sometimes difficult to get people to respond and pay attention. You had the attention of everyone and you are such a class act. It really and truly was a wonderful gift to all of us. I was amazed at the power of respect and trust everyone had as you asked them during the demonstration to do exactly what you portrayed and they did. You are an inspiring and encouraging individual coach and we all learned quite a bit from you at the meeting." "You are the teacher for the universe to fulfill your divine purpose." "Thank you for helping me through the tough times I was having and to help me forgive those that discriminated me for no reason." "Thank you so very much for your teachings and your help. It's really appreciated. I'm so thankful to you and your practice. Thank you for your gifts. I'm forever indebted to you. You're the best!" "Trying to solve my own problems I didnt know where to begin. At times I'd feel like I was in an endless loop it was stressful. My own doubts and anxieties were holding me back from escaping that monotony I had fallen in into. Meeting with Eileen helped me understand and overcome obstacles that rose from my anxieties. I can confidently say by trusting in Eileen and her techniques I'm a different person than the one who first walked through her doors." "Eileen Lichtenstein is marvelous. She had 150 college students relaxed and calm in minutes even during mid-term exam week ! 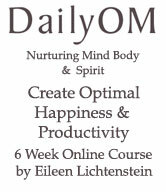 Eileen Lichtenstein is a master at teaching one how to get rid of the tension and anger of everyday stress! Eileen explains clearly how we can all live a more peaceful life in control of our feelings." "Thank you so much for coming the other evening . And for instantly freeing me from those immediate anxieties . And I will finish going through this, no cost, huge help, you freely gave us ALL! I hope I can come to you for your life coaching work soon." "If you are struggling with a behavior, habit or challenge and want to change, clear your calendar and go see my friend, Eileen Lichtenstein. She's terrific. She can help!" We look forward to your next workshop! "Many thanks for your terrific workshop today on Stress and Time Management Strategies for Optimal Happiness and Productivity. It could not have come at a better time as we are gearing up for a new academic year. The group loved the handouts and will be able to use the diary and log in the future. They also enjoyed the meditation segment. Hopefully they will continue to use the tools you provided today to build a regular practice in their lives, leading to better stress and time management and increased overall satisfaction. Of course several wished you could speak longer, but overall, you covered a lot of great material in the short time you had. Thank you again and we look forward to your next workshop! "I keep my anger in-check now, thanks to you and your program". "Eileen, I just want to thank you for all your help, positive thoughts and your professionalism." "Thank you for being an inspiration and a mentor to other women through your Feature Interview at Today's Leading Women! Women of the world appreciates you!" We look forward to learning about your current and upcoming endeavors, as you are an invaluable member of the LIPAC organization... All the Best in 2016 and beyond!" "First time on a plane in 23 years. First time on a plane clean/sober in 45. Thank you Eileen Lichtenstein and EFT". "Dear Eileen, We wanted to thank you for sharing your knowledge with our chapter of The Holistic Moms network. Not only was your presentation enlightening and informative for our members, but it was also fun! You allowed the space for us to connect to one another while delving into our own hearts. Thank you for giving us direction and teaching us a practical way to incorporate EFT into our lives as busy mothers! The impact of what you do is far reaching. When peace occurs in our homes, it branches out into our community and beyond. With much gratitude!" - extremely useful on my long, long trips between NY and NZ! Her expertise is broad and deep. Check out her book!" "I would like to highly recommend Eileen Lichtenstein and her work with Emotional Freedom Technique. I have experienced her work in her workshop in a group, and privately. During both experiences I found Eileen to be highly-skilled and deeply empathetic. Eileen was excellent at explaining this simple, yet profound healing technique that often has immediate results. And also importantly, Eileen was highly skilled at guiding us through our EFT healing processes. Her verbiage revealed her years of professional and eclectic experience in the field of holistic health." "Thank you so much for the EFT sessions - they genuinely changed my life! The snooze button no longer rules my mornings, and the afternoon "witching hour" has been made much more pleasant thanks to the techniques you taught me. And I'm no longer bringing bad feelings and frustrations about work into my home life. I highly recommend EFT to anyone who might be interested - anyone can benefit from it! Thanks again!" "Eileen, I admire your energy and style! We all enjoyed your presentation very much and I have shared the EFT technique with a few of my clients. Thank you so much for your generosity in presenting the Emotional Freedom Technique . I was happy that we got to have our meeting in your conference room at such a great location for most of the Eastern Group Psychotherapy Society Long Island members". "Thank you Eileen! You were wonderful. I enjoyed learning from you...the best I have felt in days and still do tonight; thanks for putting on the event!" "After just one session with you, I have to say that you are a very special being with a wonderful energy and spirit. After our session, I recalled the importance of learning (not to mention "hanging out" or networking) with an upbeat, enthusiastic, and fun coach/teacher. And that's you! Your attitude makes a huge difference in confidence, motivation, and my attitude about the subject of EFT." 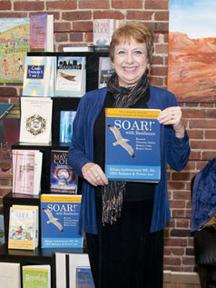 Click Here to Order "SOAR! with Resilience®"
"Thank you for your lecture on Reverse Procrastination with EFT. It brought out and large crowd of enthusiastic people who listened with great interest and began the tapping technique immediately. The Emotional Freedom Technique was new to many of us, yet it was easy to learn and to practice. Your presentation was interesting and upbeat and held our interest. I hope you will consider presenting at the Long Beach Public Library again." "Thank you for making the presentation "Workplace Stress Reduction/Management For Increased Productivity, Focus and Creativity" at the June 11, 2014 meeting of the Project Management Institute Long Island Chapter at Computer Associates". "Thank you for your wonderful presentation last Friday. Wonderful insight and demonstration! Enjoyed it very much!" "I've known Eileen for several years through networking venues in Long Island. She is always positive, encouraging and supportive, a great "go-to" professional with any life-career challenges. "I would like to take this opportunity to thank you for yet another fantastic program. 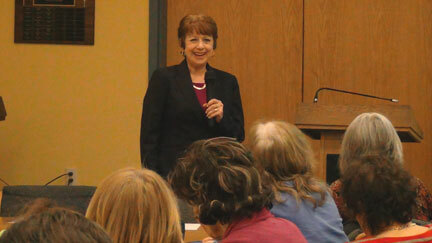 "Dealing With Difficult People" was well-received by attendees. Your PowerPoint presentation was especially impressive and I'm sure the pearls of wisdom provided to our patrons will have positive effects on their lives." "Eileen is an inspiration to me. 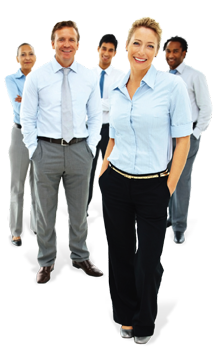 She is always finding and implementing the best, most up to date ways to reach out to and serve her client base." "Eileen, On behalf of the Graduate School, I would like to thank you for the participation in this winter's "Time Management and Stress Reduction" Colloquium. It was a tremendous success and we had an overwhelming positive response. Your commitment and involvement with graduate education programs such as our Graduate Student Advocate Colloquium contributes to the continued success of our Graduate Student community. Thank you once again for playing a valuable role by sharing your time and expertise at this semester's event." "Thank you for the compassionate guidance and assisstance you gave me during our sessions last year. You gave me invaluable tools that I will use my whole life. I have recommended your services to others as well. I hope your life work and business continues to grow and prosper! God Bless." "I want to thank you so very much for helping me in my quest to speak and give presentations in public. I saw a remarkable difference at my first presentation using the EFT, I was very calm and relaxed, there was no anxiety. I have since been using this technique before stressful situations with increasingly positive results, i.e I feel more confident and sure of myself... I am still a long way off from my goal but each situation represents practice which in turn will become perfect." "The social media event that I did today was a huge success!!! We had over 100 people in attendance and not only was I extremely comfortable, I was able to deliver a clear and concise message that was educational and inspired people. Thank you again for your help... I really do appreciate it." "Eileen, thank you for helping me see the world through my creative lens again. My life had become blurry due to the many challenges and responsibilities I was facing... I'm finally able to connect the dots and to express myself clearly. I can access my true self and reframe my challenges into positive possibilities". guides them toward the success and happiness they long for. I appreciate all that you have done for me since knowing you this past year as my life-career coach. People like you are hard to come by, who truly care and take a sincere interest in a person's well-being. "Eileen is my colleague from Motivational Whisperers, and she was also a featured guest on my radio show. Eileen's wisdom and expertise are amazing. She helps people deal with their fears, anxieties and insecurities, and guides them toward the success and happiness they long for. What I personally appreciate about Eileen is her kindness, open-mindedness and sense of humor. She is creative, loving, understanding and patient. No matter what kind of "demons" you're currently struggling with in your personal or professional life, Eileen is the one that will help you move forward effortlessly and painlessly." "I've had the pleasure to work with Eileen Lichtenstein, CEO of Balance and Power, Inc. during the last year. Eileen's dedication to her craft and the numerous individuals, businesses, and not-for-profits she has assisted locally and across the globe is apparent in her workshops, seminars and individual counseling. Her professionalism and expertise and the ability to share the skills that have brought her personal success, has helped the people she works with achieve a higher level of success, prosperity, and balance in their own lives. I recommend her highly to anyone who needs assistance in accomplishing their personal and business goals." 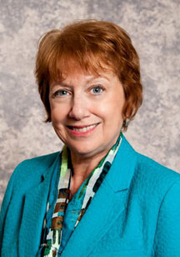 "Eileen is one of the most dedicated Career Coaches I work with. She will go the extra mile for her clients. Everyone loves her!" "Eileen gave an excellent, meaningful presentation today to the LI/NYC Area Young Widow/ers group I run. I receive only positive feedback from the many attendees who benefited from hearing what she offered on how to empower ourselves, despite the stresses life throws at us. I was impressed by her professional delivery that was both personable and insightful. She should be proud of the positive impact she clearly is making on so many people's lives." "Eileen Lichtenstein is a passionate and vital coach who works with both body and mind to create the balance and power of being who you are meant to be. In her capacity as workshop facilitator she brought great inspiration and ideas to the group, and as a colleague working in the same field with midlife women, Eileen also brings her considerable experience to bear on any groups she participates in. If you are looking for a coach, Eileen is an excellent choice." "Eileen is truly an amazing life coach. She is great to work with. If you are looking to reach goals that you think are almost impossible to attain, whether career or personal, visit with or call Eileen... She will get you there...and quickly!" "I have worked with Eileen for over a year. She helps me stay focus on my action plan. And, she gives me great feedback on my business ideas. In addition, she introduced me to several contacts that can help move my business to a higher level. It has been fun working with Eileen and I look forward to continue doing so." - Laticia Howard, Christian's Inspiration, Inc.
"Eileen - Everything (went) well in court. Thank you very much for your help. You're the best. You make me feel very good". "I really enjoyed your presentation last night. It could not have come at a better time. I've been very, very busy, feeling over-committed and stressed... I'm taking to heart your suggestion to find and maintain the balance. This weekend with work stuff piling up, chores that have to be done and then that absolutely gorgeous weekend of weather on tap, I'm going to start with a quiet meditation tomorrow morning and really be present to the choices I make, be mindful of them, be calm and concentrate on being in balance with whatever I'm doing. Thank you for the reminder, not only about how important it is to do that, and to actually take action and make it happen." "I like the professional sound of the audio and music mix. Though I've done yoga, I never had a guided moving meditation before, and it's nice to breathe into the movements."